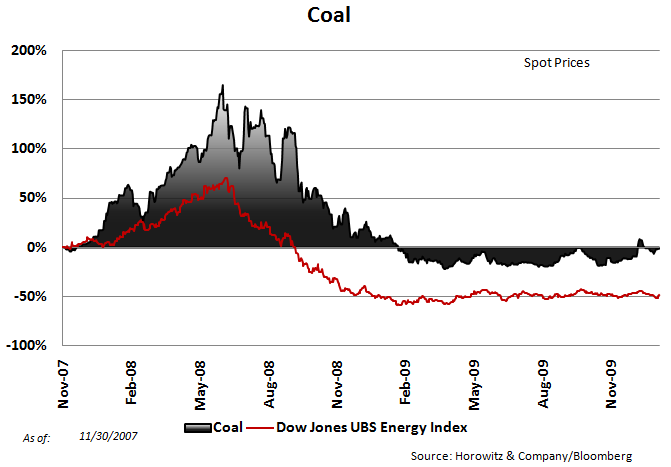 Volatile yes, but the companies in the coal industry have a great deal of opportunity ahead of them. Aside from the recent cold-snap and the fact that there are a backlog of ships waiting to load in ports around the world, coal is still one largest sources of electricity generation in the world. Note: It is our impression that there is a potential for Patriot Coal (PCX) to be a perfect candidate for a consolidation play. It is the right size and has enough potential to create a good synergy for another energy company to absorb and benefit. Coal ships queued to load for an average of 16.6 days, from 15.3 days a week earlier, Newcastle Port said. The waiting time compared with 0.14 day for general-cargo vessels. Feb. 22 (Bloomberg) — A rally that has boosted coal prices 21 percent from their lows last year may have further to go as the coldest U.S. winter in nine years and China‘s record imports increase demand and drain stockpiles. Prices will average $59.28 a ton this year, up 17 percent from $50.75 as of Feb. 19 on the New York Mercantile Exchange and 41 percent more than last year‘s low in April, according to the median of 11 analyst estimates in a Bloomberg News survey. Stockpiles at utilities swelled last year after a mild summer and the economic recession reduced power demand. China, the world‘s biggest coal user, imported 16.4 million metric tons in December, a sixfold increase from a year earlier, customs data show. Record snowfall buried parts of the U.S., the second-biggest coal consumer, including Dallas and the mid- Atlantic states. The cold weather is reducing a surplus and giving producers Patriot Coal Corp., Consol Energy Inc. and Alpha Natural Resources Inc. power to negotiate higher prices. Consol, the second-biggest U.S. coal company by market value, will jump 18 percent to $59 by the end of this year in New York trading, according to the median of 17 analyst estimates compiled by Bloomberg. Alpha, the third-biggest U.S. coal producer by output, will climb 22 percent to $57.46, analysts forecast. Patriot rose 35 cents, or 2 percent, to $17.62, today in New York Stock Exchange composite trading, the highest price since Jan. 21. Consol added 3 cents, to $49.94. Alpha slipped 16 cents, or 0.3 percent, to $46.94. Massey Energy Co., the sixth- biggest U.S. coal producer, climbed 12 cents, or 0.3 percent, to $44.39. Hedge funds have been buying energy producers, mining companies and airlines, a sign that managers from Louis Bacon to David Tepper are convinced the economy will accelerate. Duquesne Capital Management LLC, led by Stanley Druckenmiller, bought 6.2 percent of Massey, whose earnings are projected to double this year. 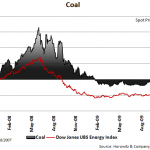 The increased U.S. and Chinese consumption prompted Michael Dudas, an analyst at Jefferies & Co. in New York, to raise his 2010 price target for coal to $70 per ton, a figure he originally forecast for 2011. Utilities have 57 days worth of coal on hand, down from more than 70 days at the start of winter, according to Genscape Inc., a Louisville, Kentucky-based energy data provider. Coal is used to generate electricity and produce steel, making it a barometer for the economy. U.S. steel capacity utilization tumbled to 68 percent as of Feb. 15 from 91 percent in August 2008, according to the American Iron and Steel Institute, as unemployment climbed to 10 percent and consumers reduced spending 3 percent on appliances in December from a year earlier. The U.S. summer from June through August was 7 percent cooler than the same period a year earlier, reducing demand for power to run air conditioners, according to the National Oceanic and Atmospheric Administration. Prices plunged 66 percent to $48.15 per ton at the end of 2009 from a record $143 on July 1, 2008, the steepest decline in at least eight years, according to data compiled by Bloomberg. The 17 percent gain forecast by analysts would be the largest since 2007. Utilities amassed a record 207 million tons as demand for coal to generate electricity dropped 12 percent through Sept. 30, according to the most recent U.S. Energy Department data. Consumption for 2009 was projected to be below 1 billion tons for the first time since 1995. The government will release final figures in March. Producers cut back output as demand slumped and that‘s having an impact even as demand rises. U.S. coal production will slump about 2.8 percent this year just as exports increase 5.6 percent, the Energy Department said Feb. 10. The 2009-2010 winter season, which began Dec. 1, is the coldest since the 2000-2001 season and ranks in the coldest third of winters in the past 115 years, according to Jeff Masters, director of meteorology for Weather Underground Inc., a private forecaster based in Ann Arbor, Michigan. The federal government shut down for four days this month after Washington was hit with a storm that set a seasonal snow total of 54.9 inches, shattering a 110-year-old record. For St. Louis-based Patriot, Pittsburgh-based Consol and Alpha, based in Abingdon, Virginia, the frigid conditions are providing relief. The risk to forecasts for higher coal prices is a glut of natural gas in the U.S. and prospects for the economy to stumble as the Federal Reserve boosts interest rates for the first time since June 2006. The Fed last week raised the discount rate charged to banks for direct loans by a quarter point to 0.75 percent to encourage banks to borrow in private markets. The U.S. relies on coal for about half of its power generation, compared with about 20 percent for gas. Gas has to stay above $5 per million British thermal units to prevent it from being more attractive to utilities at the expense of coal. Natural gas for March delivery fell 14.9 cents, or 3 percent, to $4.895 per million Btu. Rollyson estimates that through November coal lost about 40 million tons worth of demand to gas. China‘s National Energy Administration said Jan. 25 that a coal shortage will persist through March. The country has maintained the record import pace set in December because of the country‘s coldest winter in at least 50 years, according to Sutthichai Kumworachai, an analyst with KGI Group in Bangkok. The country‘s gross domestic product expanded 10.7 percent last quarter from a year earlier, the fastest pace since 2007, after the government introduced a $586 billion stimulus package that spurred energy consumption. China‘s appetite for coal led to imports from South Africa, diverting supplies from Europe and creating an opportunity for eastern U.S. coal companies such as Alpha Natural Resources, Consol and Patriot to increase sales across the Atlantic Ocean, Brean Murray Carret‘s Sussman said. This year Consol has sold almost 500,000 tons of coal into Asian markets, a 23 percent increase from the 400,000 tons that it shipped to the region for the first time last year, Dan Zajdel, a company spokesman said. As more companies follow, the exports will squeeze U.S. utilities, said Pearce Hammond, an analyst at Simmons & Co. International in Houston. From the mid-Atlantic to the Southeast through the Gulf Coast into Texas, temperatures are averaging 4 degrees to 8 degrees below normal, said Tom Kines, a senior expert meteorologist with AccuWeather.com in State College, Pennsylvania. “That is pretty significant,” he said. The cold is having an impact as measured by heating-degree- day values, which have been trending higher along the East Coast and across the South, according to the National Weather Service. The value is calculated by subtracting the average daily temperature from a base of 65 degrees and is designed to show energy demand. This month, New York‘s heating-degree-day value is 572, or 36 greater than normal, according to the National Weather Service. Coal prices will get a larger boost if the U.S. economy can sustain its recovery, Alpha Chief Executive Officer Kevin Crutchfield said in an interview. The world‘s largest economy will grow 3 percent this year and next, according to the median estimate of 62 economists surveyed by Bloomberg News.